The corporate lawyer turned investor took to Twitter to shed light on the pressure she dealt with as an attorney. “I regularly worked 400 hours a month as a lawyer,” Ellen Pao recently tweeted, reflecting on the extremely demanding workload she undertook as a corporate lawyer. The tech investor, diversity and inclusion activist, and cofounder of Project Include released a series of other anecdotes online, detailing the destructive, and often unhealthy characteristics of her former job in corporate law. The experience that emerged from Pao’s tweets gives voice to an epidemic that affects so many, but often goes unacknowledged because of society’s tacit acceptance of the hazardous pressure of corporate lifestyles. 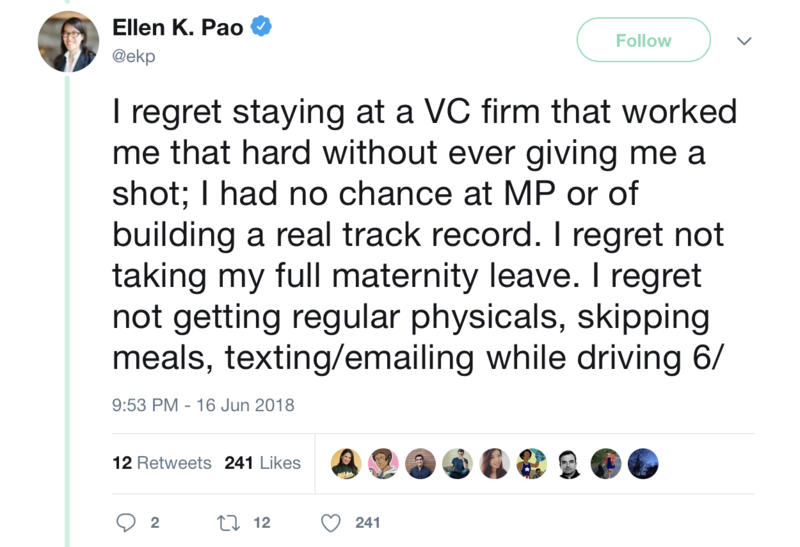 After leaving corporate law, Pao faced “similar hours” in tech, where her body faced ultimate burnout symptoms as and threatened her physical health. In her tweets, she mentioned the cysts her body developed in response to the stress, her endometriosis diagnosis, and even a tragic miscarriage.